Last week I and a few other foodies were treated to a night out at KREAM in Pretoria. 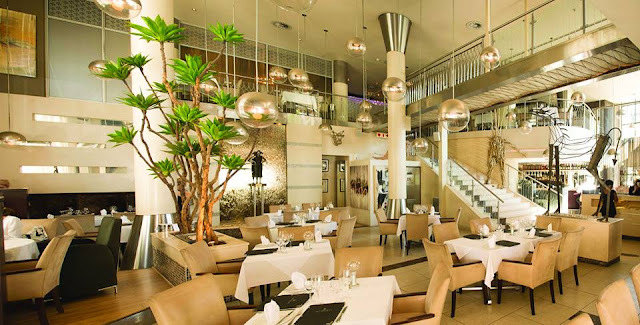 I had heard of this restaurant a while ago and have been wanting to try it but Pretoria is a little out of my way and so I never got around to visiting them. A big thank-you to Zomato for the invite! My favourite thing about Kream is without a doubt the decor. It was absolutely stunning and filled with interesting pieces of art works which kept my eyes exploring through out dinner. If you're looking for a place to take someone on a special occasion then Kream is it, this magnificent restaurant will definitely impress even the toughest critic. Once I had taken in the 'view' it was time to look through the menu. We had a set menu for the night but I had a browse through the standard menu and was very impressed by the number of dishes available. Not only was the menu extensive but it was also creative. From gourmet sushi to quail, there really is something for everyone! For starters we had Salmon Tartar, cucumber ribbons, red onion & coriander salsa, crisp tortillas, coriander oil. The salmon tarter was so soft and creamy and I savoured every mouth full! The dish was presented beautifully and it was enjoyed by all. 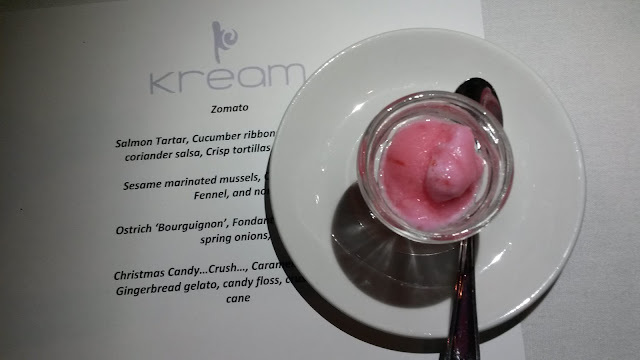 Between each meals we were served a strawberry sorbet palate cleanse and some commented that they would order the sorbet for dessert if they could - it was really good! Next up was my favourite dish of the night, sesame marinated mussels, crayfish bisque, fennel and nor. For me, mussels is always a safe starter, they are always tasty and the standard creamy wine sauce that they come in is usually great. Kream managed to take this dish a step further with the crayfish bisque and nori which brought out the 'fishyness' of the mussels and nearly made my mouth water! Ostrich 'Bourguignon', fondant potato and braised spring onions was the next dish to be served. I was looking forward to the ostrich as I've only had this a few times in my life. The meat was done well and the portion size was great but compared to the other dishes I felt that the presentation fell short and that the single potato and spring onion on the side was a bit of a let down. Last but not least the dessert - Christmas candy crush, caramelised popcorn, gingerbread gelato, candy floss and crushed candy cane.... sounds divine right? The pure creativeness of this desert won me over, then when it arrived, it looked spectacular and when tasted it me all expectations! Throughout the night we were served wine specifically paired to each dish and whilst I'm not a huge wine drinker, the wines selected complimented each dish perfectly. 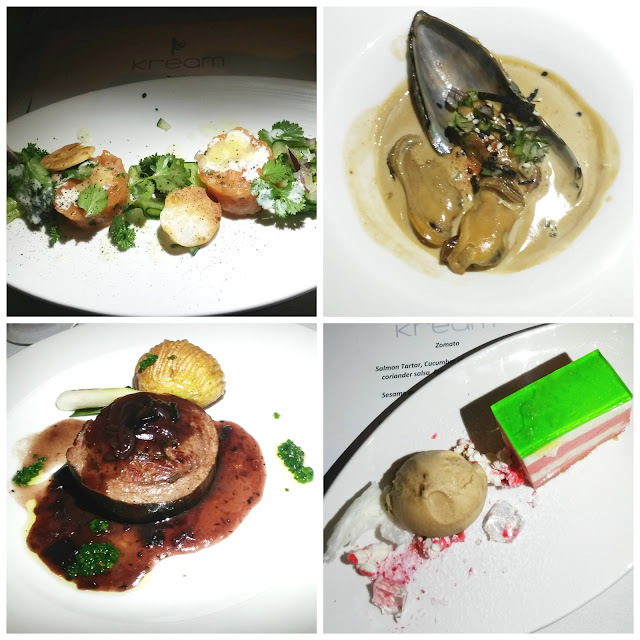 I rated Kream 4.5 out of 5 on Zomato and you can read my review HERE.